Organize your online bookmarks with this fast and FREE service. Just 1-click for your often-visited web sites! No ads, no service. Available for Iphones, Android and other smartphones also. If you have a question about the Bookmarkee Online Bookmark service, may be we have an answer here. Q. What is this Bookmarkee service? A. In short, this is an online bookmarking service. You can register for your private bookmarks page (password protected) and store bookmarks to web pages that you need to visit regularlyONce you do that, you can access these web pages with 1-click. Q. But I can do the same thing with my browser (Internet Explorer or Firefox or Opera). Why do I need your service? A. You are right. IE, Firefox and other browsers all offer a similar service. There are 2 problems with using that. a) You cannot use those bookmarks when you are not accessing the Internet from your computer. b) The straight line list offered by your browser is very difficult to use. Bookmarkee allows you to store the bookmarks under various groups, all visible together on your page under multiple columns. This saves a lot of time locating the bookmark and then accessing the site. you can even highlight the significant links with color or text-effects like bold and italics. Q. How is Bookmarkee different from del.icio.us? A. 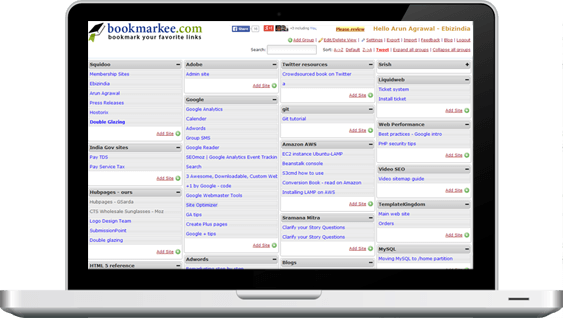 While both are bookmarking services, Bookmarkee is significantly different from Delicious. Delicious offers a social bookmarking service where you recommend a web page to others. Strictly speaking you can use it for your personal use also (they have started offering a private option) but that is not the basic purpose of their service. You would not like to recommend the login page of your hosting service control panel on delicious but that will be a great link to add to your Bookmarkee bookmarks page. You typically add the exact page that you need to visit regularly, to your Bookmarkee page while you recommend the site home page or section home page on delicious. Delicious pages list the links in a vertical line fashion in chronological order of adding and you cannot change this order. Bookmarkee lets you view the links in multiple column format, organised under stacked groups. This makes it very easy to locate the site that you need to visit. Q. Do you record the number of times I have clicked on certain links? Can I see those stats? A. Sorry, no. All the links on your Bookmarkee page are direct links and we do not record how many times you are clicking on any link. Q. I have stacked 2-3 groups in a column and therefore a scroll bar has come up. I want to see the details of the lower group on the main screen (above the fold). How can I do that? A. You can click on the minus (-) sign just before the group name of the upper group. This will collapse this group and bring the lower groups up. Now you can see the entries in there. Click on the plus (+) sign to expand this group again and push the other group(s) down. Q. Can I change the group under which a link appears? A. Yes. You should click on the Edit/delete view in the menu near the top right corner. This will redraw the page by putting edit and delete options under every link. Click on the Edit option. Now choose the correct group in the group selector drop-down. Then click on the save changes button. Q. Can I delete a link that I don't need? A. Yes. You should click on the Edit/delete view in the menu near the top right corner. This will redraw the page by putting edit and delete options under every link. Click on the Delete option. Confirm on the pop-up box that appears next and the link is gone! Your online journey becomes easier with Bookmarkee - start here.